GRAB YOUR GIRLFRIENDS AND GO! 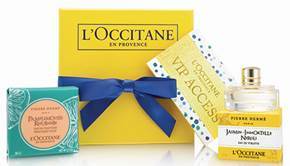 This Thursday, November 5th, 2015, grab a bunch of girlfriends and head to your local L’OCCITANE store to kick off the holiday season with complimentary mini-facials, hors d’oeuvres and champagne. If you spend $65 or more you’ll receive two travel-size products from their new macaron-inspired collaboration with Pierre Hermé, as well as an exclusive invitation to a private sale.